Tableau is a popular data visualization and analytics tool favored by financial analysts, marketers, statisticians, business and sales professionals, data scientists, developers, and many others who need to explore insights and present visual, easy-to-understand data. Visual Analytics with Tableau is an accessible, step-by-step introduction to the world of visual analytics. This up-to-date guide is ideal for both beginners and more experienced users seeking a practical introduction to the fields of data analysis and visualization. Through hands-on examples and exercises, readers learn how to analyze their own data and clearly communicate the results. This guide covers everything you need to get started with Tableau, from the first steps of connecting to data, creating different types of charts, and adding calculation fields to more advanced features such as table calculations, forecasts, clusters, and R, Python, and MATLAB integration for sophisticated statistical modelling. User-friendly instructions for existing options within the Tableau ecosystem—Tableau Desktop, Tableau Prep, Tableau Server, Tableau Online, and Tableau Public—enable you to integrate, clean, and prepare your data and share your work with others. Alexander Loth is a data scientist with over 10 years’ experience in the Enterprise software space, focused primarily on Digital Transformation, Big Data, Machine Learning, and Business Analytics. Since 2015 he has been with Tableau Software as Digital Strategist in Frankfurt, Germany where he guides organizations to evolve their data-driven culture. Prior to Tableau, Alexander was a Data Scientist at CERN and worked as a consultant for Capgemini and in software engineering at SAP. If you’re keen to go from beginner to expert in Tableau, Alexander’s excellent book gives you everything you need to know. With a crisp and clear style, he talks the reader through all aspects of Tableau, from data cleaning through data analysis and into sharing insight with others. If you’re getting started with visual analytics and Tableau, this book will teach you everything you need to know to build the foundations and understand how and why to explore your data visually. Alexander has created a fantastic resource that guides you step by step through the process of preparing your data, using Tableau Desktop to analyse it and finding insights. He helps you deliver your message with clarity by applying best practices for data visualisation and takes you through the dashboard building process. Put this book on your desk as your own personal companion for your journey into and through the world of data. 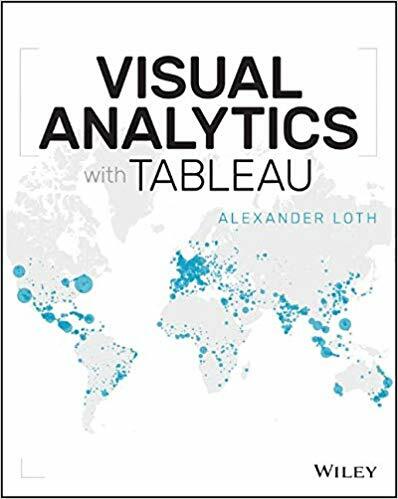 Visual Analytics with Tableau – an easy to understand book by Alexander Loth, one of Tableau’s very first employees based in Germany, a recognized speaker on countless conferences, and a Tableau Jedi. It contains both the basics and advanced Tableau features. If you ask me: there is nothing more you need to get started with Tableau!